A road trip to the country isn’t just for weekends. Recently John and I took a mid-week drive out to Langley for a dinner and movie, leaving behind our walkable West End neighbourhood and taking advantage of having wheels to get us out to corners of the 604 we rarely have the opportunity to visit. 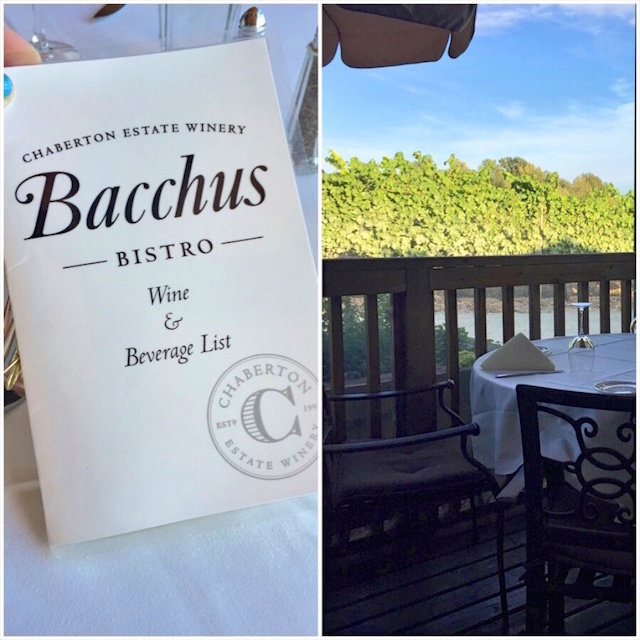 Plotting a course to the award-winning Bacchus Bistro at Chaberton Estate Winery, we followed the commuter crowd out of the city on a warm late summer afternoon. Heading south through the tunnel, John opened the power moonroof on the all new Honda HR-V, which was released in July of this year. Its blend of SUV-like versatility with a car-like drive wrapped in bold exterior styling puts the HR-V has made it an instant hit. For me, having driven most of the Honda fleet, it felt like the love child of a Honda Fit and a Honda CR-V. It had the fuel efficiency, responsiveness and sporty feel of a fit, mixed with the comfort and roominess of the CR-V. Crossing the Nicomekl River on Highway 99 we were almost sideswiped by an SUV as they swerved into our lane, just as we were on the narrow bridge. I moved evasively, honked, and they swerved again to right themselves in their lane. Luckily it wasn’t too much of a close call, but still I had the Vehicle Stability Assist with Traction Control on the HR-V which would have really helped. John looked over and the passengers were looking down at their phones for directions. They turned off at the next exit and we kept on going, following the directions we were getting from our built in Honda Satellite-Linked Navigation System. Even if the HR-V didn’t have a navigation system, it still has USB ports where you can plug in your phone and to receive Google Maps turn-by-turn directions that play out loud over the vehicle’s stereo. There really is no excuse to be on a handheld device while driving! We pulled into Chaberton Estate Winery where visitors were picnicking on the lawn out front. We walked around to the bistro at the back that borders the vineyard, it was already busy at 6:00pm on a Thursday. 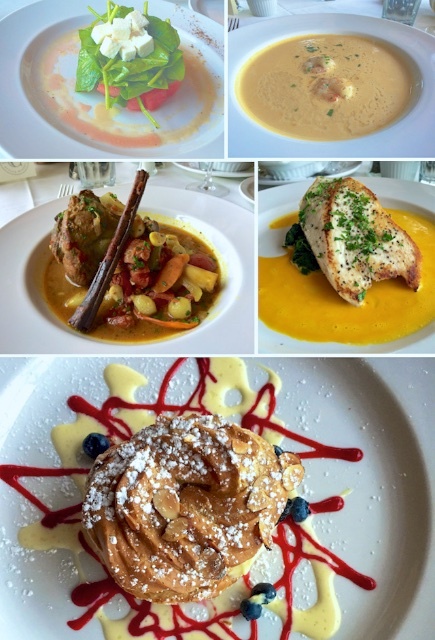 I ordered a prix-fixe tasting menu and John went with one of his go-to meals, roast lamb. Since I was the designated driver, I gave him the go-ahead to order wine with his meal, and since we were mere feet away from lush, late season grapes on the vine, he happily agreed to partake. He went with Chaberton’s 2011 Reserve Syrah (British Columbia BC VQA) and loved the pairing so much that we hopped into the wine shop after our meal to purchase a bottle to bring home – so that I could enjoy some later on. From Chaberton, we called up Twilight Drive-In on the HR-V’s navigation system and followed its directions as we chased a sunset through Langley Township. Fiery orange and pink clouds hung over pastures with grazing horses and fields of tasseled corn. Arriving at the drive-in movie – John’s first drive-in experience ever – we were told that we could park anywhere, even though SUVs and over height vehicles usually have to park along the back rows so they don’t obstruct the view of other cars. Nevertheless, we parked our zippy HR-V behind a row of smaller cars and settled in for the movie, tuning into the film’s audio on the radio using the 7 inch touch-screen system. 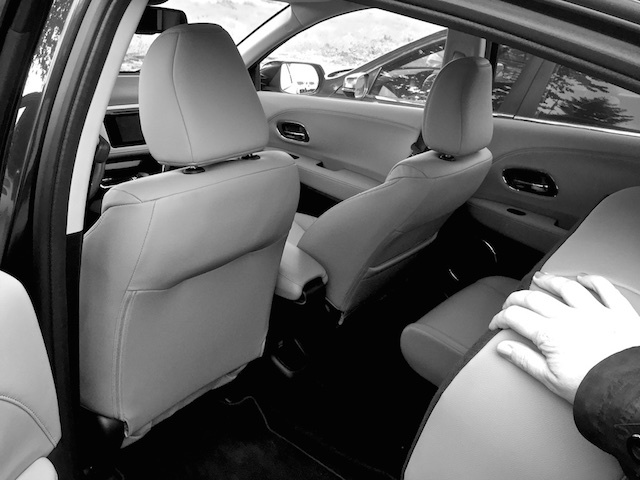 We sat back on the HR-V’s trimmed leather seats as The Man from U.N.C.L.E. played from the 6 speaker system, filling our ride with audio from the Guy Ritchie spy comedy. At the end of the show we could have stayed for the double feature but since it was a work night, we packed up and headed home to Vancouver via Highway 1. Dinner, a movie, with a safe and comfortable ride. Pull up sets in the back in case we needed more cargo room. Our Thursday night date night in Langley was a success, thanks to the Honda HR-V, which we were sad to return to Honda headquarters the next morning but it was nice to finally enjoy that 2011 Reserve Syrah the following night at home and plot our next romantic adventure outside of the city. This post is sponsored by Honda Canada. Views and opinions are my own. I saw the HR-V at the Auto Show earlier this year and am intrigued at this new class of vehicle. We loved our Fit, even though it was hardly the most powerful thing in the world. 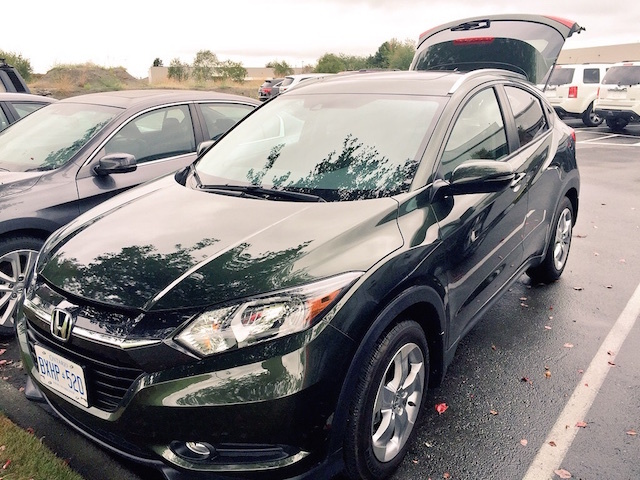 Really comfortable, great drive, remarkably roomy and very versatile. 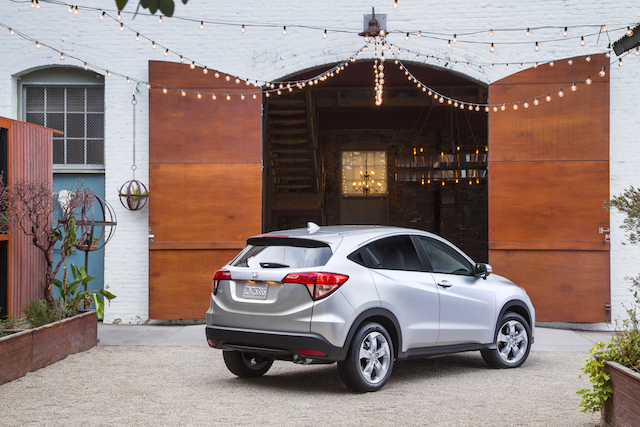 It’ll be interesting to see how well the HR-V holds up to other cars in this new class, like the Mazda CX-3.